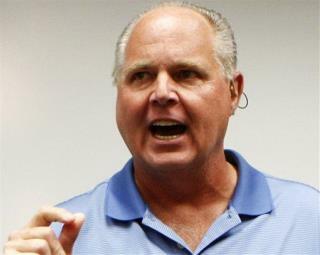 (Newser) – Rush Limbaugh gave President Trump some advice on his radio show Wednesday, and in the Washington Post, Chris Cillizza thinks it's wise, politically speaking. Trump's White House has been beset with controversy after controversy, forcing Trump to seem as if he's "always on defense," Cillizza writes. Limbaugh's advice is for Trump to focus on repealing ObamaCare, then on tax reform, moving full speed ahead and making obvious tracks on the domestic agenda. Cillizza says the advice is "very, very smart," considering how "successful, relatively speaking" Trump's first week in office was. Trump has no major legislation. Executive orders count as activity not results. He is s'more falling on his rear more the kicking rears. I realize that President Trump, (for ALL American Citizens), needed to Change a number of Terrible Laws President 0bama-been-laughin forced upon the Citizens of America---But--I feel that he should be conducting changes in this Order: 1. Reinforce World Power, ( WITHOUT the Draft)...........Unless you want Anger here at Home. 2. Get the Economy Back FOR THE PEOPLE. When one has to pay nearly $20.00 for a Chinese Pr. of Jeans that lasts maybe 5 washings, (Walmart), or a Push Lawn Mower from Sears @ $390.00, a Gallon of gas @ 2.80 a Gallon, or a Dozen of eggs @ $2.50 doz...something is Wrong. America won't Prosper, when Citizens are Struggling. 3. JOBS. Get busy ! I have posted a number of times that if a " Land Beautification" Program for each State (roads, Historical sites, Museums, rest areas, Planting Trees, Streets, State Building Repair, or New JobTraining Programs, for Senior Citizens, no matter what the Income.....& employment for Poverty families, Gives HOPE. 4. Religion. Part of the President's Campaign included Supporting What America was founded on............Religion. Help Bring GOD Back to America. President 0bama-been-Laughin supported Activities AGAINST Christianity. OFFER FAITH-BASED GRANTS. 5. Bring an end to Supporting Countries that Hate us, like Iran. The Billions not given to those against America, can be used here- AT HOME! My Blessings are enumerous. I am a Conservative Catholic. As an Administrator of a Federal Program, I have seen what Projects need to be opened FOR AMERICAN CITIZENS.